Bellapais village has been captured by the Turkish army after Turkey attacked CYPRUS July 20, 1974. 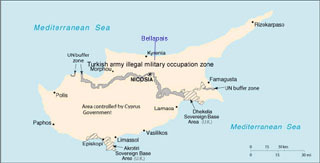 All Greek Cypriots inhabitants were forced out by Turkish military forces and are now refugees in their own country. GREEK LAWFUL INHABITANTS NEVER FORGET, and wait for the holy day of RETURN. 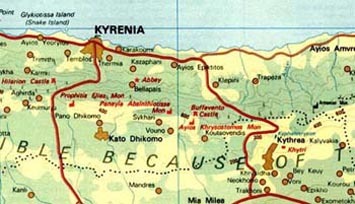 Click on the map of Cyprus to see enlarged the location of Bellapais village. 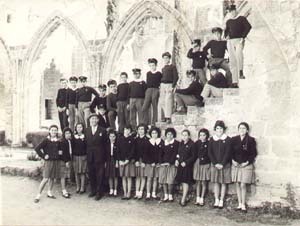 Students of the GREEK High School of Kyrenia visiting the Bellapais Abbey in Bellapais village, Kyrenia district Cyprus - before 1974 barbaric Turkish invasion. Click to enlarge. "No one can rest, no one's conscious can be clean, until the hour comes when all refugees return to the ancient Greek land of Kyrenia. 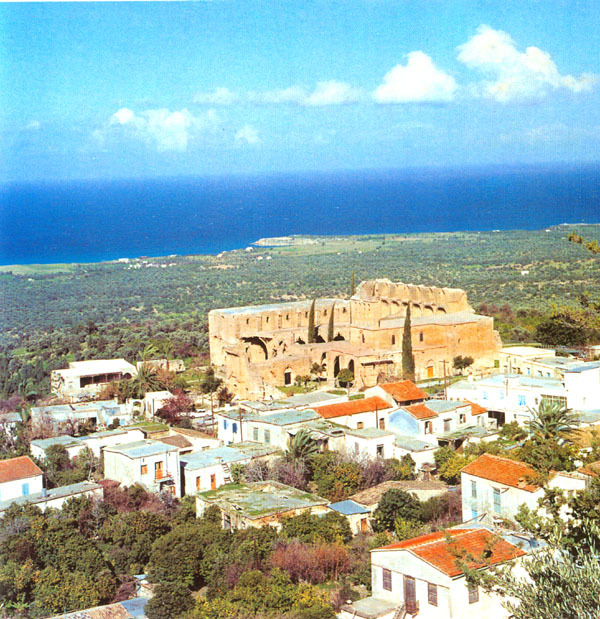 Kyrenia is the land where we belong, is the land of our ancient history, it is where our identity exists". The next eight photographs displayed below are courtesy of artist photographer Jacques Jakovides. 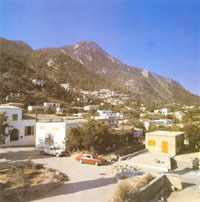 Panoramic view of graphic Bella-pais, an occupied village in Kyrenia district in Cyprus. In the forefront you can see the legendary ancient Abbey of Bellapais. Its present name derives from the French "Abbaye de la paix", which means "The Peace Monastery". 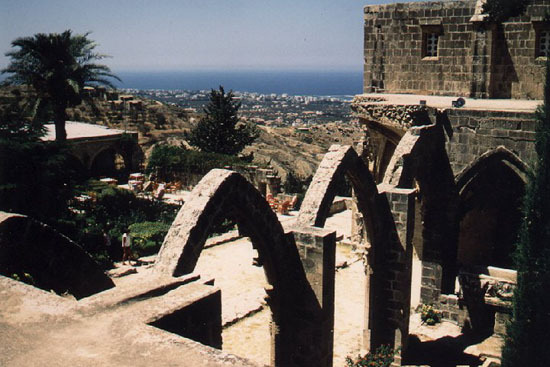 The first settlers of the monastery are the priests of the Augustinian order who had migrated from Jerusalem. 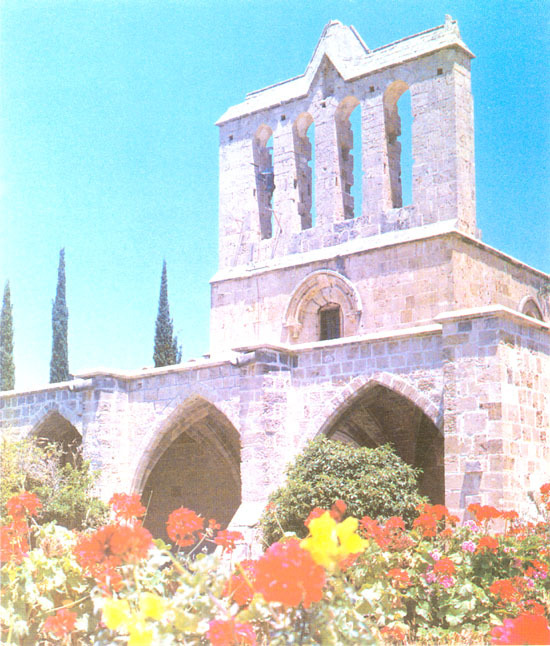 The first monastery building was constructed between 1198-1205. The French King Hugh III between 1267-1284 built most sections of the building as seen today. The pavilions around the courtyard and the refectory were constructed during the reign of King Hugh IV (1324-1359). In the far horizon you can see the beautiful sea of Kyrenia, while the whole Bellapais village is surrounded by beautiful green flora. 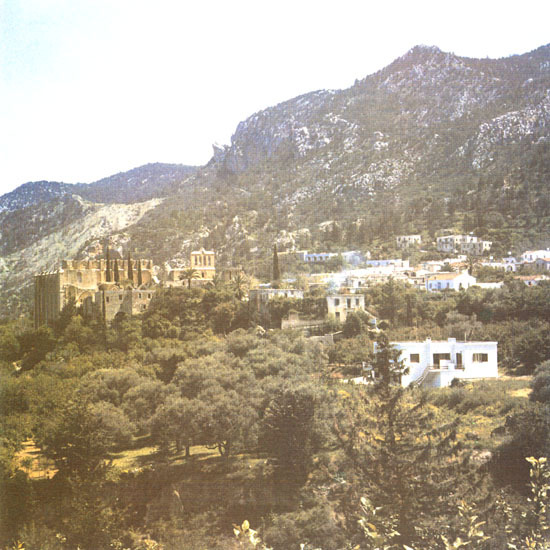 Bellapais has been captured by the Turkish army after Turkey attacked CYPRUS July 20, 1974. All Greek Cypriots inhabitants were forced out by Turkish military forces and are now refugees in their own country. NEVER FORGETTING, they are waiting for the holy day of RETURN. 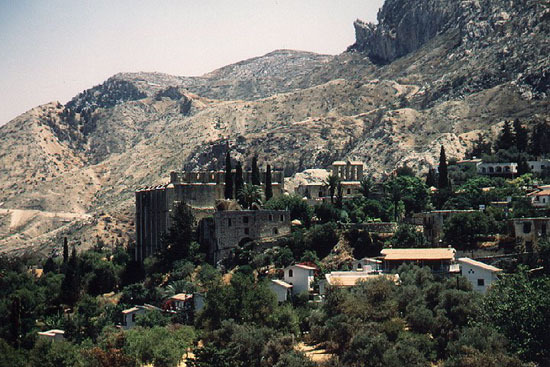 The ancient Greek Orthodox church of Mother Mary, white-dressed, Παναγία Ασπροφορούσα alongside the Bellapais Abbey. According to legend the name was taken after the white color of the costumes of the monks occupying the Bellapais Abbey. These ancient Greek monuments are now under ILLEGAL Turkish MILITARY occupation. They are used by the Turkish militants to attract tourists in Bellapais and benefit economically by their illegal occupation of Cyprus. At the same time, the right of trespassing and owning of properties to the lawful inhabitants of Bellapais is CONTINUOUSLY DENIED since 1974. 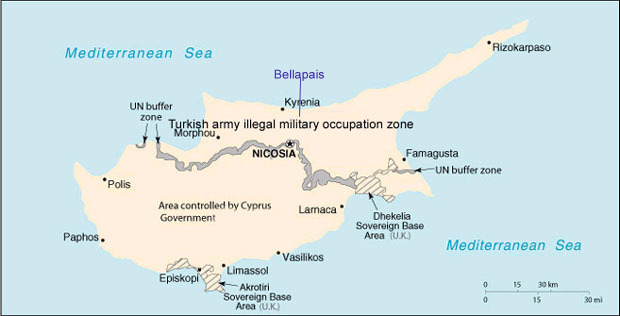 We urge you, not to visit occupied areas of Cyprus, as you will provide economic and political support to the Turkish militants and help prolong the illegal military occupation. Another panoramic view of Bellapais village from the west. You can clearly see the natural blend of the houses and the flora of the area, always under the view of Mount. Pentadachtylos. Down the hill from Bella-pais, is the beautiful sea of Kyrenia which completes the magical scenery. Another panoramic view of Bellapais from the west. You can clearly see the natural blend of the houses and the flora of the area, always under the view of Mount. Pentadachtylos. Down the hill is the beautiful sea of Kyrenia (not shown in the pic) which completes the magical scenery. 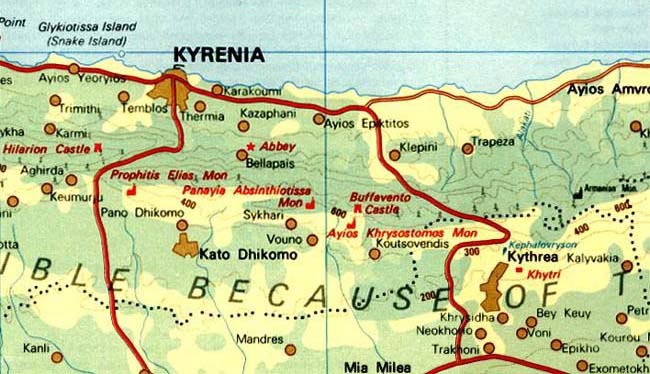 Greek Cypriots, lawful inhabitants, are now refugees in their own country since 1974. We wait, and demand our return to Bellapais. A scene with a shepherd in Bellapais. 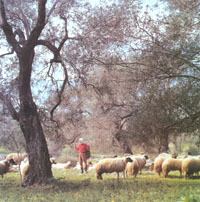 You can see most common sheep found in Cyprus and olive trees in the background. Picture was taken before the July 20 1974 Turkish invasion. All 8 color photographs displayed above are courtesy of artist photographer Jacques Jakovides. A picture from the south-east side inside the Bellapais Abbey looking north-west. In the far horizon you can see the Kyrenia sea. In addition you can see the burnt valley leading to the sea. 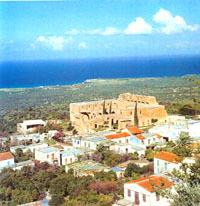 A recent picture of Bellapais village from the west. 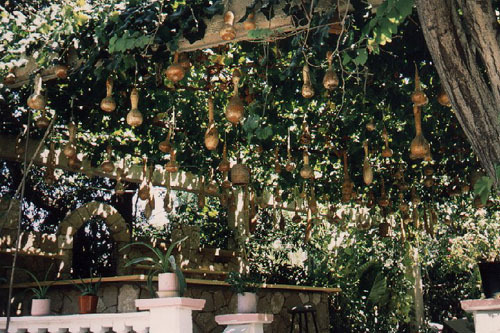 The tradition of "kolokythes" hanging down in Bellapais village. 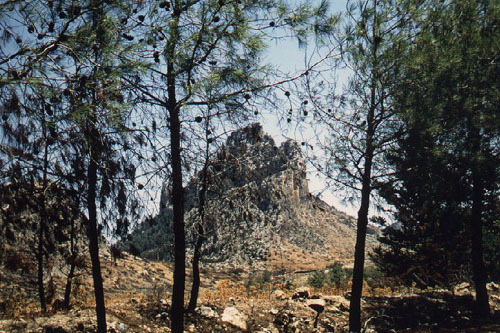 Mount Pentadactylos in Kyrenia waits for our return. 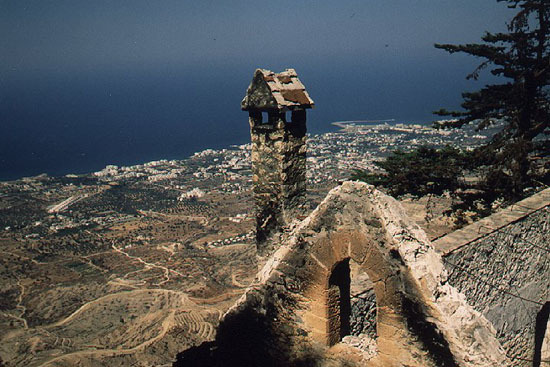 A view of Kyrenia from St. Hilarion Byzantine castle on mountain Pentadactylos. You can see the burnt valley after a recent HUGE fire. 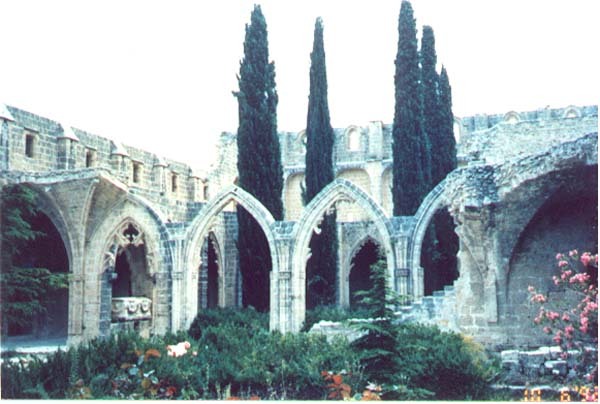 The Bellapais Abbey in now occupied Bellapais village in Kyrenia district CYPRUS. Greek lawful inhabitants wait the holy day of Return to Bellapais. Click to enlarge. 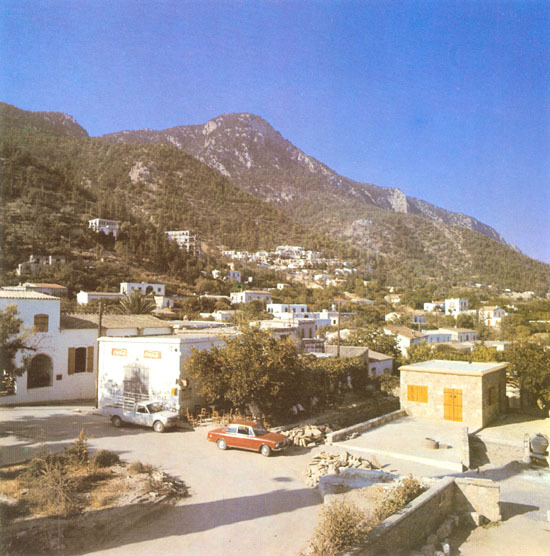 Click on the map to see Bellapais in Kyrenia district, CYPRUS. For problems, or questions regarding this web site contact Christos A. Neophytou.